In 1964 Japan, high school girl Umi (Sarah Bolger) lives and works at her grandmother's boarding house while her mother studies medicine in America. Umi's father died in the Korean war, and she honors his memory by flying signal flags that can be seen by boats passing by the boarding house. The flags are seen by Shun (Anton Yelchin), another student at Umi's school who is inspired to write a poem about them. Circumstances bring the two young people together in an effort to save the Latin Quarter, an old building on campus that has clearly seen better days but which many students consider an important meeting place (almost a frat house, it seems). They clearly have chemistry, but a surprise revelation throws a major monkey wrench into their budding romance. Not only does it seem the lovestruck teens are doomed to be “just friends”, the fate of the venerable school building appears grim as well. 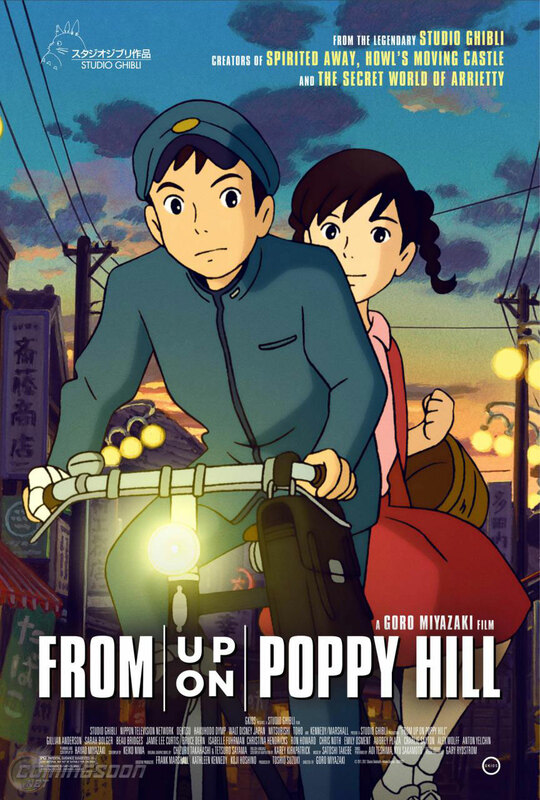 Grim, however, is not a word one could use to describe FROM UP ON POPPY HILL, the latest animated feature from Studio Ghibli. It's a colorful, sunny film full of optimism tempered with just the right amount of nostalgia and melancholy. Renowned anime director Hayao Miyazaki and Keiko Niwa co-wrote the screenplay based on a Japanese comic book (or “manga”, if you prefer), but it is Miyazaki's son Gorō who handles the directing duties here. It's not as visually striking as Miyazaki senior's films, but give that this is a far more grounded story that's as it should be. Less forgivable is the blandness of the narrative. Despite its unusual complication, the love story isn't particularly interesting, and the whole “save the orphanage” plotline about the school building is just as generic as it sounds. Somewhat more interesting is the film's theme about the past having value, even when there are parts of it one might wish to forget. This is certainly an issue that would resonated with the post-war generation of Japanese youth depicted here. The film does a good job of conveying that by contrasting the optimism and desire for modernization brought about by the Olympics with the efforts to preserve the beloved but run-down old school building. The version of the film being distributed by Disney theatrically in the U.S. is dubbed. That will no doubt rankle some of the purists, but while I too would have preferred seeing the film in its original language with subtitles, the English language voice acting is fine. In addition to the two leads, the cast includes such familiar names and voices as Jamie Leigh Curtis, Gillian Anderson, Aubrey Plaza, Christina Hendricks, Bruce Dern, and Ron Howard. 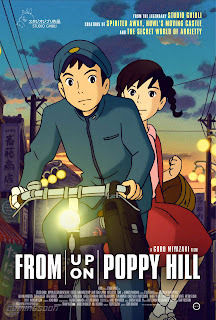 All in all, FROM UP ON POPPY HILL is an agreeable enough lightweight youth romance. It's always nice to see animation used for something other than kiddie fare and/or fantasy make it to the big screen, and compared to most of the movies Hollywood makes for and about teens these days, this is practically a masterpiece. Certainly for that demographic, especially the ones who already make a habit of watching anime, I would recommend this film. For the older movie goer who maybe only dabbles occasionally in anime I can't quite go that far, but I wouldn't try to talk them out of seeing it, either. 2 1/2 out of 4 stars.